Taking GED or vocational classes in prison is not unusual. 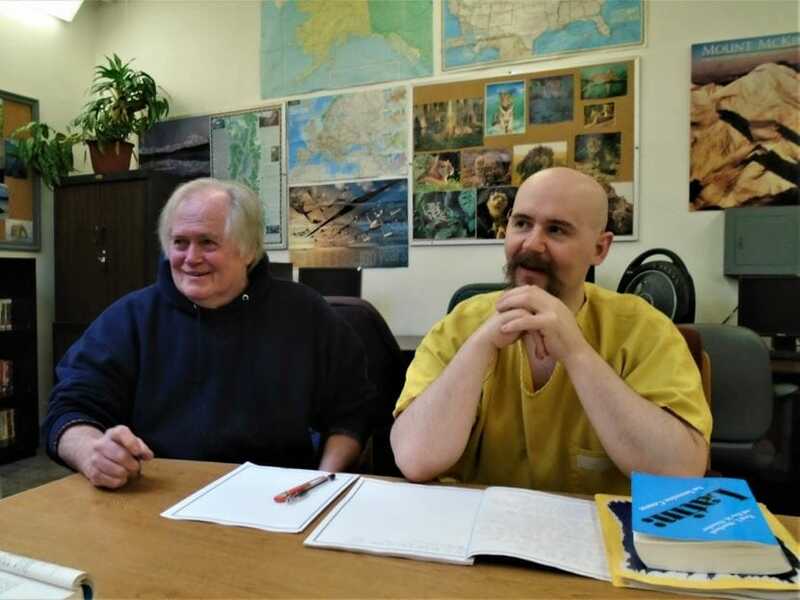 But at Juneau’s Lemon Creek Correctional Center, a small group is studying Latin, a language that’s been dead for centuries. Visitors to Lemon Creek Correctional Center pass through three locked gates. You surrender your phone, keys — pretty much everything but your ID. Once you pass through the final door, you’re locked in with 200 inmates. “I call them my captive audience,” Jim Hale, a former college professor who teaches writing at the prison, said. Hale began teaching at Lemon Creek about four years. Over time, he grew closer with some of his more dedicated students. A few months ago one of them approached him with an unusual request: Would he consider teaching Latin? Hale learned Latin years ago as a graduate student studying Renaissance literature, but he hesitated. His Latin was rusty, and why would anyone want to learn a dead language, let alone in prison? “The one thing about Latin is, you’ll see anybody who’s been to jail or has to deal with legal process, you see a lot of Latin words a lot of people are not understanding,” Lemon Creek inmate Lowell Ford said. Ford has had enough experience with legal proceedings to recognize a number of Latin phrases, but that’s not why he asked Hale to teach the class. Since joining Hale’s writing class four years ago, Ford has worked hard to improve his style. But he’s a perfectionist — constantly editing and revising his work, never quite feeling satisfied with it. Ford likes to write as concisely as possible, which makes choosing his words carefully very important. “With no grasp of Latin then the grasp of English seems to be kind of fleeting and you lose where the word came from or what the word truly is supposed to mean,” Ford said. In his writing classroom, Hale peppers his lectures with discussions of Latin etymology. Hale always told his students that understanding the original meaning of the words you want to use is the only way to really get across what you want to say in writing. Knowing that, Hale said yes. The former professor and freelance writing instructor even bought the Latin textbooks out of pocket. The class meets weekly for an hour in the prison library. During a recent lesson, they examined a poem about Dido, queen of Carthage. Four men in faded yellow jumpsuits took turns translating lines of text into English. Sometimes they paused on a tricky word until Hale offered up a gentle hint to get them going again. Ford says the vocabulary is particularly tricky for new learners. So much of English evolved from Latin, as did the meanings of many words. “When you’re memorizing Latin original words, sometimes the English words try to superimpose themselves over the Latin origination words,” Ford explained. “For instance, our words ‘fact’ and ‘fiction’ come from two Latin words meaning the same thing,” Hale added. Ford said he spends more than an hour each night in his cell going over vocabulary and conjugation. He’s been reading the Aeneid in his spare time. “It’s like learning how to spell for a spelling bee; you take a list of words and you repeat them numerous times and then you write them and you write them and you write them,” Ford said. They don’t spend much time on pronunciation — Latin hasn’t been spoken as a native language for more than a thousand years, after all. The goal is simply to understand the texts they study. Hale said teaching the class forced him to revisit a subject he thought he’d never study again. Ford has been at Lemon Creek for about six years. He’s not due for release until 2020. He’s 39 now, and he knows learning new languages and subjects will only get harder. But he said he’s grateful for the opportunity. “It makes a section of time that would normally not have much value for me, turn into something that can be positive,” Ford said. The class may go on hiatus later this summer while Hale is out of town, but Ford said he plans to continue practicing alone and with his classmates.